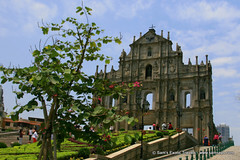 Macau, the oldest European colony in China, was settled by the Portuguese in the 16th century. It is located 70 km southwest of Hong Kong and 145 km from Guangzhou. The Portuguese government transferred ownership to China in 1999, and it is now run, as is Hong Kong, as a Special Administrative Region (SAR). Cantonese is the official language, but Mandarin, Portuguese and English are also spoken. Macau's total population is 450,000 among which over 96% are Chinese; the rest are mainly Portuguese. Historic European influences are very obvious: charming colonial buildings and churches intermingle with local Chinese architecture making for an interesting mix. Macau's bi-cultural heritage is evident everywhere, creating a unique, laid back atmosphere. 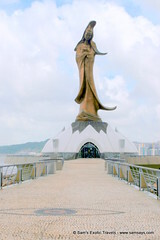 Situated on the Chinese coast at the entrance to the Pearl River, tiny Macau comprises three areas, namely Macau Peninsula, Taipa Island and Coloane Island, surrounded by sea from three sides, linking the Zhuhai Economic Special Zone in the north of Guangdong Province, facing Hong Kong in the east with a distance of 40 nautical miles only an hour’s distance by hovercraft.